Microgaming is well known for its unique themed slot machine, and this is certainly one of these unique games as it is themed around the mysterious and the beautiful Lady in Red. The Lady in Red is a singer who works in a bar/restaurant and this is why players will notice that all of the symbols are based around the lady and her work at the bar. 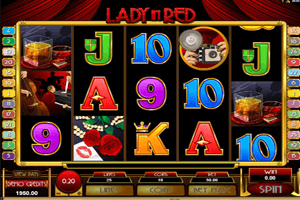 Play Lady in Red Slot here. These symbols will be seen on the 25 lines of the video slot and the 5 reels. These icons include the lady in red singing, flowers and roses, whiskey shots, a pianist, card symbols, the logo of the game and a camera. The game has plenty of winning opportunities that it offers to its players. For starters, there are the 25 chances of claiming a payout through the online payouts. Players can earn great rewards that they can check at the paytable of the game. The highest line payout is given to players who get 5x logo of the games on the same line, they will win up to 12500. This high paying symbol is also the wild symbol that will replace any of the other icons on the reels and the lines of the slot game. All wild wins are multiplied by a 2x multiplier. The camera is the scatter symbol that gives great pays and can also trigger the free spins round (up to 25 free spins).